RSI 3 ft. Commercial All Weather Landscaping Ground Covering Rolls-100 ft. The Riverstone Industries Line of 3 ft wide commercial landscaping all Weather ground covering rolls designed to offer easy to use, Professionally used and requested 3.2 oz. 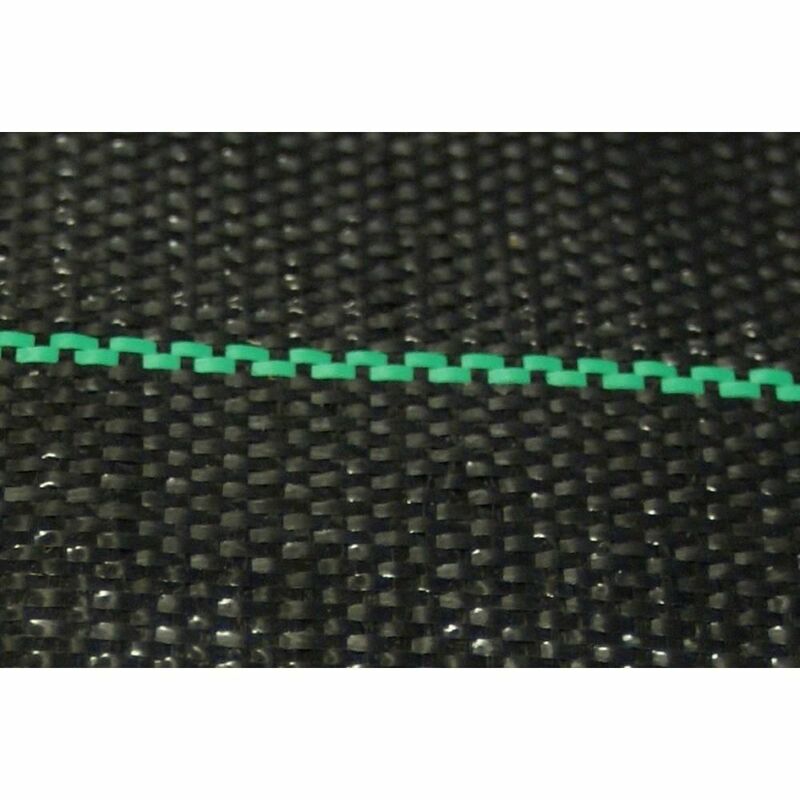 thick black woven polypropylene fabric with pot lines that are 12 inches apart for easy line-up. The material is designed to left water flow through the fabric while preventing weeds, rocks or animals from coming through. This fabric carries a 20 year warranty. The EasyFlex Aluminum Landscape Edging by Dimex is the perfect choice for homeowners and contractors alike, offering professional grade quality. Its name speaks for itself with easy installation - simply slide the ends of the material together with an approximate 4-inch overlap, insert the provided spikes at a 450 angle and enjoy a permanent and virtually maintenance-free solution to the infamous curb appeal dilemma. EasyFlex will not rust, rot or become brittle like other edgings and straight runs or curves can be created with ease. It is made from recycled material, is non-toxic, has excellent corrosion resistance and is all-around environmentally friendly. This set is available in a variety of colours including silver, black, brown, bronze and green. Popular applications include landscape beds, tree rings, walkways and pathways, brick or stone patios, gardens, drip edges and more. EasyFlex Aluminum Landscape Edging by Dimex is the perfect choice for homeowners and contractors alike, offering professional grade quality. Its name speaks for itself with easy installation; simply slide the ends of the material together with an approximate 4-inch overlap, insert the provided spikes at a 450 angle and enjoy a permanent and virtually maintenance-free solution to the infamous curb appeal dilemma. EasyFlex will not rust, rot or become brittle like other edgings and straight runs or curves can be created with ease. It is made from recycled material, is nontoxic, has excellent corrosion resistance and is all-around environmentally friendly. This set is available in a variety of colours including silver, black, brown, bronze and green. Applications include landscape beds, tree rings, walkways and pathways, brick or stone patios, gardens, drip edges and more. EZ Edge professional grade aluminum landscape edging, by Dimex, LLC. is the perfect choice for owners and contractors alike. Its name speaks for itself because installation is easy simply slide the ends of the material together with an approximate 4 inch overlap and insert the provided spikes at a 45 degree angle and enjoy a permanent and virtually maintenance free solution to the infamous curb appeal dilemma. EZ Edge will not rust, rot, or become brittle like other edgings on the market, and straight runs or curves can be created with ease. It is made in the U.S.A. from recycled material, is non-toxic, has excellent corrosion resistance, and is all around environmentally friendly. Colour is MILL finish (silver). Available in a variety of other colours black, brown, bronze and green. Applications suggestions include landscape beds, tree rings, walkways and pathways, brick or stone patios, gardens, drip edges and more. EcoBorder is moulded from recycled tires, giving it the look of stone with the flexibility of rubber. Its trademark mower edge design eliminates the extra maintenance of string trimming. Will not heave or crack from root growth or seasonal changes in the ground. Beautifully textured, our EcoBorder is also mould and mildew resistant. 3 ft. Commercial All Weather Landscaping Ground Covering Rolls-100 ft. The Riverstone Industries Line of 3 ft wide commercial landscaping all Weather ground covering rolls designed to offer easy to use, Professionally used and requested 3.2 oz. thick black woven polypropylene fabric with pot lines that are 12 inches apart for easy line-up. The material is designed to left water flow through the fabric while preventing weeds, rocks or animals from coming through. This fabric carries a 20 year warranty.